Last week, a man was sexually assaulted when someone posed as his rideshare driver. Here's how to stay safe when using apps like Uber and Lyft. Ridesharing apps, such as Uber and Lyft, have changed the way people travel. Now it is easier than ever to get from one place to another without a car of your own. But with the convenience comes a risk. Just like with taxis, ridesharing apps have customers get into a vehicle with a complete stranger. When you get into someone else's car you give up a lot of control -- which is a scary thing. Just last week, a man posed as a driver for hire on the 1300 block of H Street, NE, around 3 a.m. and picked up a man who believed he was his driver. The victim was then sexually assaulted by the fake driver but thankfully survived. Police have not confirmed which car service the suspect pretended to be a part of, but they did say it was not a taxi. Keep these tips in mind to help you stay alert and prepared in case the worst happens. Ridesharing apps such as Uber and Lyft will tell you the make, model, and license plate of the car that will be giving you a ride. Before you get into any vehicle you believe is your driver, always make sure the license plate on the car corresponds with the one on the app. A few years ago, my fiance and I were vacationing in Miami and ordered a Lyft through our phone. When a car arrived that fit the make and model, I noticed the license plate was completely different. The driver told us to get into the car, but I refused. He claimed he had recently re-registered his car and had gotten a new license plate. He even knew my fiance's name. I did not get into his car until he pulled up the app on his phone and proved that he was the driver we ordered. Fake drivers likely count on people being in a hurry or distracted and just jumping into the car. Especially with very common makes and models, it is crucial you ensure you are entering the correct car. If a driver has a low rating on the app, it could be because the driver has made multiple passengers feel uncomfortable in the past. Don't be afraid to hurt the driver's feelings. If you feel uneasy about the situation, just cancel the ride. Uber and Lyft now allow you to share your route info with family and friends. 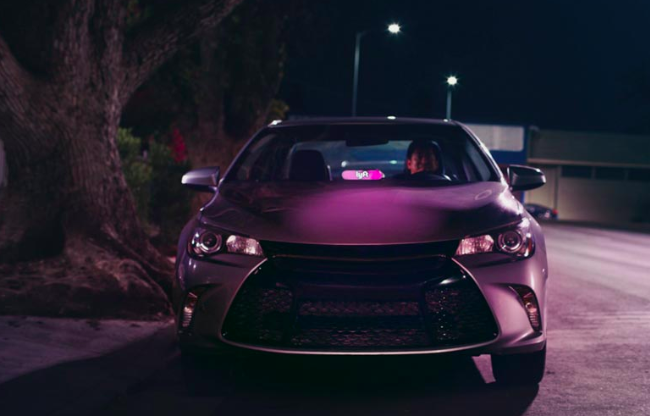 On Lyft, click "Send ETA," and your friend will get a text message with a link to your current route and location. On Uber, click "Share status," and your friend will receive your driver's name, photo, license plate, and location. This way, someone knows where you are and what time your ride should be finished by. If something is off, they can contact the authorities. If you know the area you are in, keep an eye on the route your driver is taking. Even if you are unfamiliar with the area, you can check the route your driver is taking directly on the app. The app will show you the best route to get to your location, and you can see if your driver takes a different route. Put some distance between you and the driver, and sit in the backseat. A few years ago, an Uber driver picked up an intoxicated woman from a D.C. bar and brought her to a motel where he raped her. The victim had been at a bar with friends and had become unconscious. Believing they were doing the right thing, the woman's friends called her an Uber to get her home safe. Unfortunately, the woman was left alone in a car with a stranger in a vulnerable state. If you or your friend are intoxicated and need a ride home, either stick together or find a trusted friend to pick you up. This is a safety tip people have probably heard many times before, for good reason. Our instincts are built on our knowledge and past experiences to help guide us toward the right choices. Some of our instincts, such as fight-or-flight, are biological responses that are hard-wired into our brains to help us survive. People, especially women, are often taught to be polite and courteous. But sometimes you need to listen to your instincts and end a situation, even if you risk coming across as rude. During my trip to Miami, I made sure to stay firm with the driver for hire. I would rather have him thinking I was a rude person than have myself enter an unsafe situation to appease someone else. What do you think? What safety tips do you use to stay safe? Let us know in the comments below! So ... D.C. has a rat problem.